For African Americans, the Bible’s Exodus narrative is a cultural touchstone. Since before the Civil War, the story of the Israelites’ slavery and deliverance has spurred comparisons to black people’s experiences in the United States. 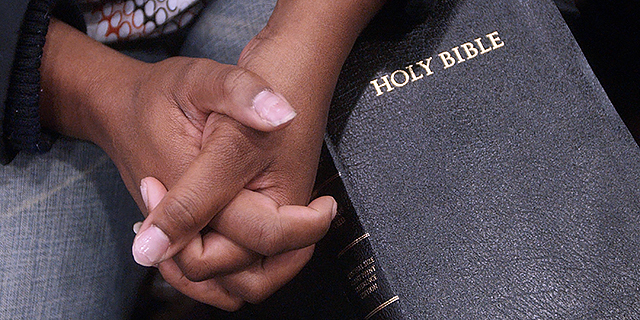 Scripture’s importance to the black population in the U.S. is reflected in Pew Research Center survey data showing that black people are more likely than most other Americans to read scripture regularly and to view it as the word of God. Indeed, more than half of black people in the U.S. (54%) – both Christian and non-Christian – say they read the Bible or other holy scripture at least once a week outside of religious services, compared with 32% of whites and 38% of Hispanics, according to data from the 2014 Religious Landscape Study. Indeed, relatively few black people (24%) say they seldom or never read the Bible, compared with 50% of whites and 40% of Hispanics. Among Christian groups, 61% of those who are members of the historically black Protestant tradition (more than half of all black Americans) read scripture at least weekly, similar to the level seen among those in the evangelical Protestant tradition (63%). 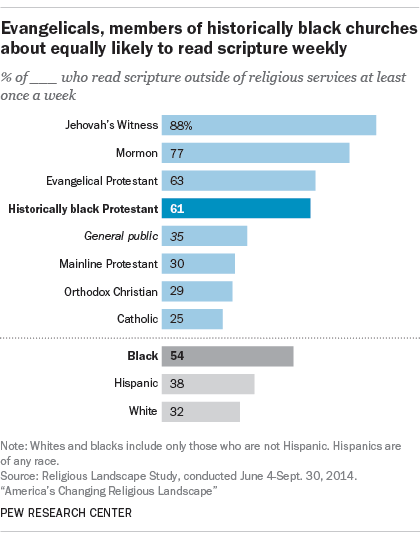 In addition, those in the historically black Protestant tradition are much more likely than Catholics (25%) and mainline Protestants (30%) to say they read scripture at least weekly, though less likely than Jehovah’s Witnesses (88%) and Mormons (77%). A sizable share of all black people (77%) also say the Bible is the word of God (as opposed to having been “written by men”), compared with 57% of whites and 65% of Hispanics. 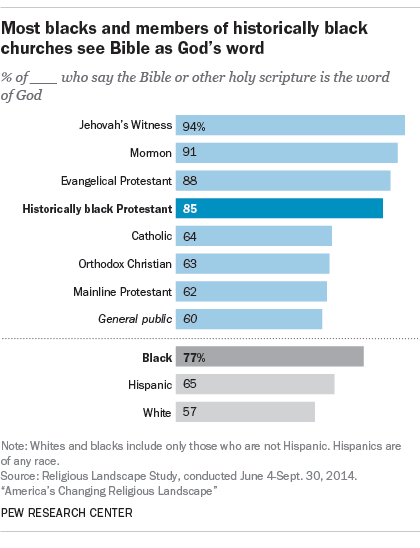 Among those in the historically black Protestant tradition, 85% say they believe the Bible is the word of God, a level more comparable to that seen among those in the evangelical Protestant tradition (88%), Mormons (91%) and Jehovah’s Witnesses (94%) than among Catholics (64%) and mainline Protestants (62%). Black people overall are also more likely than people in other racial or ethnic groups to believe the Bible or other holy scripture should be interpreted literally. Roughly half (51%) of black Americans feel this way, compared with 26% of whites and 38% of Hispanics. Among those in the historically black Protestant tradition, 59% hold this view, compared with 24% of mainline Protestants and 26% of Catholics. On this issue, the views of those in the historically black Protestant tradition are more comparable to those of evangelical Protestants (55%). Another sign of the importance of the Bible to African Americans is their participation in prayer and scripture study groups. (Our question did not distinguish between the two types of groups.) 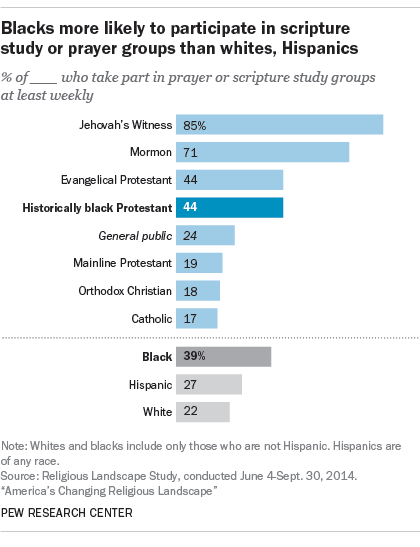 Across religions, black people in the U.S. are more likely to take part in prayer or scripture study groups at least weekly (39%) than are whites (22%) and Hispanics (27%). And people in the historically black Protestant tradition are as likely to do this (44%) as those in the evangelical tradition (44%) and more likely to do this than are Catholics (17%) and mainline Protestants (19%). They are less likely to participate in prayer and scripture study groups weekly than are Mormons (71%) and Jehovah’s Witnesses (85%). The populations of each of these religious traditions include people of many different races and ethnicities. Even the membership of the historically black Protestant tradition is not entirely black, with 6% describing themselves differently, e.g. white, Hispanic, or from another or mixed racial background. That being said, majorities in most major religious traditions in the U.S. are white.